One morning you wake up, and your twenties are over. True story. I was in a bit of a panic about turning thirty, not because I was worried about getting older, I was just sad that I wasn’t going to be in my twenties anymore. Does that make any sense? The last 48 hours of my twenties were pretty incredible. I stood by as one of my best friends gave birth to a perfect little girl. It began with an early morning phone call, followed by hours of hanging out and sleeping at the hospital. And then everything happened really quickly. I saw things that I never thought I would ever be so close to. The baby’s head, then a tiny shoulder and then little baby cries – all of it flashing before my eyes. The things I had been upset about the week prior to that suddenly seemed so unimportant. It was a life changing moment. I turned thirty two days later. It’s wild how fast ten years come and go. What’s even more crazy is how much everything changes. I never could have imagined my life as it is today back when I was twenty. I never could have dreamed of the people that would fill my life, the experiences, the decisions I would make. It has been an amazing decade. I would not change a thing. In my early-mid twenties, I used to make CD mixes for birthdays and holidays and distribute them to friends. In the spirit of those old mixes, I compiled a playlist of thirty songs for my thirtieth birthday, all produced in my thirty years of living. Some are old favorites, some are new favorites, others are significant in terms of time and place. There was also a cake. Because the week leading up to my birthday didn’t go quite as planned, the cake came a few days later, which was totally fine by me as there were plenty of celebratory cupcakes consumed over the course of the birthday weekend. The passion fruit and lime Bavarian cake is a Tartine classic. I’d been waiting a while for an excuse to make this cake, and what better excuse than a big birthday? 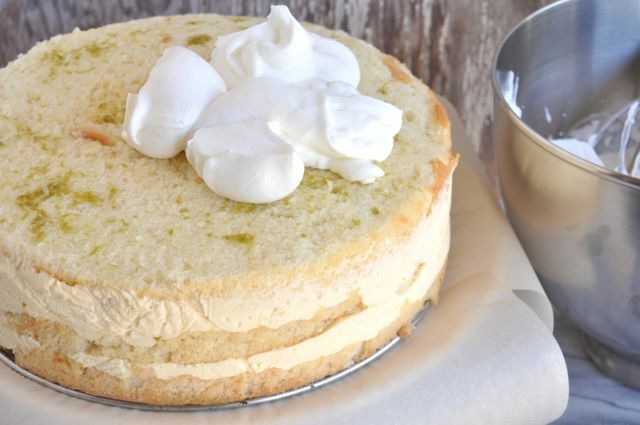 It involves layers of chiffon, passion fruit Bavarian cream, and shaved coconut. Everything about this cake is scrumptious and it’s also extremely light, so be careful, or you might find yourself going to town. Not that there’s anything wrong with that. But don’t say I didn’t warn you. Preheat the oven to 325°F. Line the bottom of a 10-inch springform pan with parchment paper cut to fit exactly. Do not grease the sides of the pan. Sift together the flour and baking powder into a large mixing bowl. Add 1-1/4 cups of the sugar and the salt and whisk to combine. In a small bowl, whisk together the oil, egg yolks, water, vanilla, and lemon zest. Make a well in the flour, add the yolk mixture, and then whisk thoroughly and quickly for about 1 minute until very smooth. Place the egg whites in a large mixing bowl. Using a mixer fitted with the whisk attachment, beat on medium speed until frothy. Add the cream of tartar and beat on medium-high speed until the whites hold soft peaks. Slowly add the remaining 1/4 cup sugar and beat on medium-high speed until the whites hold firm, shiny peaks. Using a rubber spatula, scoop about one-third of the whites onto the yolk mixture and fold in gently to lighten the batter. Gently fold in the remaining whites just until combined. Pour the batter into the prepared pan, smoothing the top with an offset spatula if necessary. 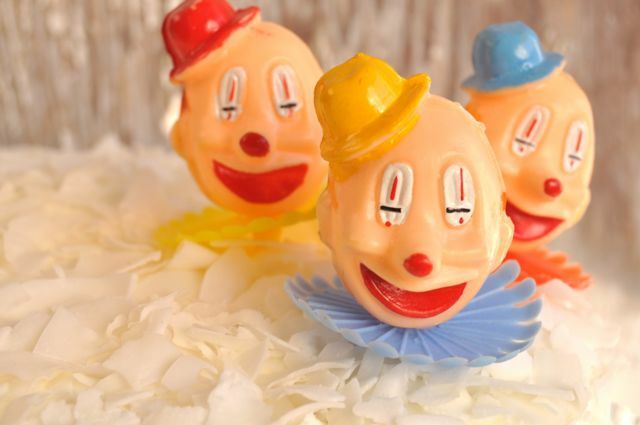 Bake until a cake tester inserted into the center comes out clean, 45-55 minutes. 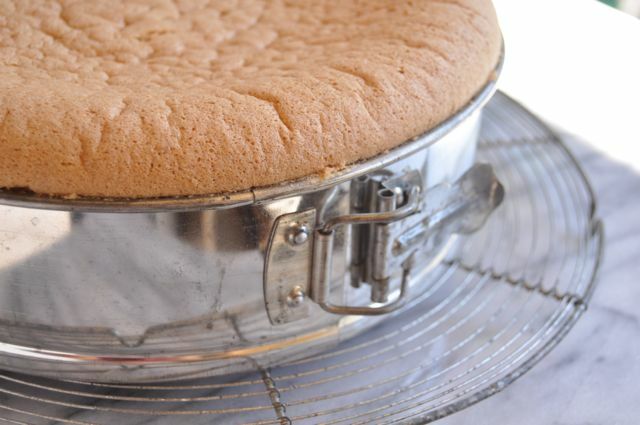 Let cool in the pan (the sides of the pan will help hold the structure of the cake as it cools) on a wire rack. To unmold, run a small, thin knife around the sides of the pan to loosen the cake and then release and lift off the pan sides. Invert the cake, peel off the parchment, and cool completely. The cake will keep, well wrapped, in the refrigerator for up to 4 days or in the freezer for up to 1 month. When ready to assemble, split the cake into 4 layers. You will only need 3 layers for this recipe. Reserve the extra layer for another use. Combine the sugar and water in a small, heavy saucepan and bring to a boil, stirring with a wooden spoon. When the sugar has dissolved, remove from the heat and chill until cool, about 30 minutes. Whisk the lime zest and juice into the syrup. Line the sides of the springform pan with plastic wrap, allowing enough overhang to cover the top of the cake completely when it is assembled. Leave the bottom of the pan unlined. Fit1 cake layer into the bottom of the pan. Using a pastry brush, moisten the later with one-third of the lime syrup. Set aside. Pass the passion fruit pulp through a fine-mesh sieve placed over a small bowl and discard seeds. In a large bowl, prepare an ice bath of both ice and water. In a medium saucepan, bring about 2-inches of water to a simmer. Combine the egg yolks, sugar, passion fruit, and salt in a stainless steel bowl that will rest securely in the saucepan, making sure the bottom of the bowl does not touch the water. Whick together and then place over the saucepan and continue to whisk until the yolks are hot to the touch (120°F), about 7 minutes. This is the bombe. Meanwhile, sprinkle the gelatin over water in a small dish and let stand for a few minutes to soften. When the bombe is ready, add the gelatin and whisk well to dissolve. Remove the bowl from the hot water and nest the bowl in the ice bath jsut until slightly cool to the touch, whisking to cool the mixture evenly. In the bowl of a mixer fitted with the whisk attachment, whip the cream until it holds medium-stiff peaks. Scoop about one-third of the cream into the bombe. Gently fold in the remaining whipped cream with a rubber spatula. Working quickly, pour half of the mixture onto the first layer of cake. Top with the second layer, being careful as the filling is very liquid. Brush this layer with half of the remaining lime syrup and then immediately pour the remaining Bavarian cream over it. Carefully top with the last layer and moisten it with the remaining syrup. Fold the overhanging plastic wrap over the top of the cake, covering completely, and refrigerate overnight. When you are ready to finish the cake, release and lift off the pan sides and peel away the plastic wrap. Using a wide metal spatula, transfer the cake to a serving plate, if using, or leave it on the cake pan base. Using a whisk or stand mixer fitted with the whisk attachment, whip the cream until thickened. Add the sugar and whip until the cream holds soft peaks. Using an offset spatula, frost the top and sides of the cake with the whipped cream, and then sprinkle the top and sides with coconut. 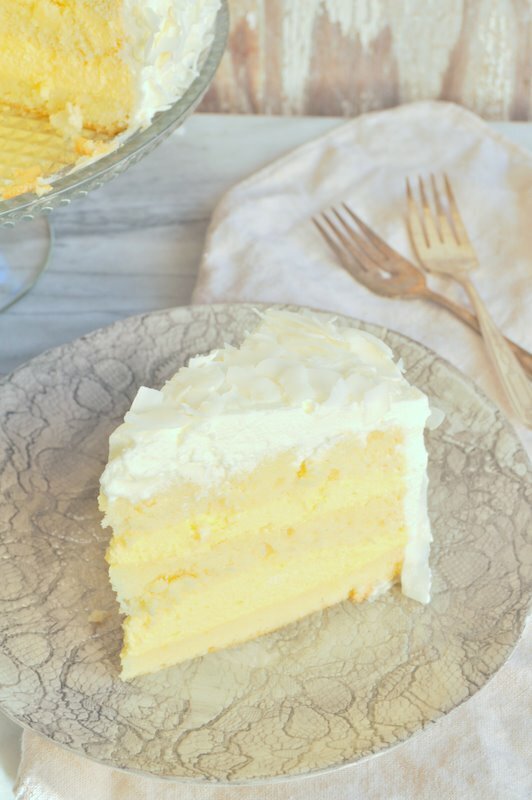 Return the cake to the refrigerator for about 2 hours before serving to allow the coconut flakes to absorb the moisture from the cream and soften. Serve the cake cold. It will keep in the refrigerator for up to 1 week. Finally finding this out of print documentary on DVD after a decade of searching. The best ever 10-hour documentary on the history of rock and roll = 10 hours of nerding out at home. Very influential in my formative years. Thank you, PBS, for your excellent programming. And thank you, ebay! Fresh San Marzano tomato sauce. And simple pasta dinners. Homemade puff pastry and an Italian plum tart. I’ve always thought of puff pastry as something you buy. All of those layers of buttery goodness seemed too good to be able to produce in your own kitchen. But after reading over Alice Waters’ recipe for easy puff pastry, it actually seemed very doable. I was feeling up to a challenge and decided I must give it a go. Making this puff pastry was actually pretty easy, it just requires time. It’s essentially a large mass of butter and some flour rolled out and folded several times. Nothing to be scurred of. With my 2 pounds of puff pastry ready to go, I knew exactly what I wanted to make. 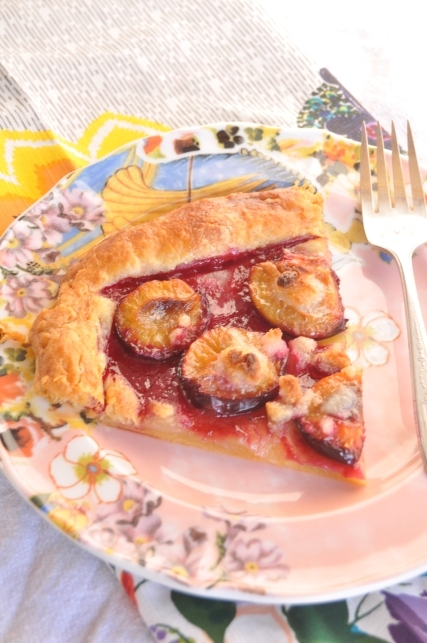 Earlier this summer I made a plum tart with store-bought puff pastry. It was great, but I really wanted to try it with my handmade goods. And since there were finally Italian plums at the market, I knew it was time to make it again. This is one of those throw-together, simple summer desserts. Whether you use homemade puff pastry or the store-bought stuff, it’s a winner. The plums and almond paste together are perfect. When combined with the sugar, the plum juices transform into a beautiful, sticky, slightly caramelized lacquer. And the puff pastry is awesome – buttery and flaky and buttery. Preheat the oven to 400°F. Roll the puff pastry on a lightly floured surface into a 1/4-inch thick rectangle. With a pairing knife, lightly score a 1/2-inch border around the entire pastry. Prick the dough inside the border all over with the tines of a fork to prevent it from puffing up too much during baking. Transfer the dough onto a parchment-lined baking sheet. Sprinkle the dough evenly with a few tablespoons of sugar. Arrange the plums cut side up in the center of the pastry, then sprinkle them with the remaining sugar. Dot the tart with butter and sprinkle with almond paste. Brush the 1/2-inch border with the heavy cream. Bake the tart until the pastry is deeply browned around the edges and the plums are soft and jammy and their juices are bubbling and syrupy, 30-40 minutes. Best served the same day it is prepared. Excellent warm or at room temp. Place butter in the freezer for 30 minutes. Combine the lemon juice and water in a measuring cup. Combine the flours and salt in the bowl of a stand mixer fitted with the paddle attachment and mix on low speed. Add the chunks of cold butter a handful at a time, taking about 30 seconds to add it all. Mix for 30 seconds more, or until the edges of the butter have rounded off. Slowly add the water and lemon juice, pouring along the inside edge of the bowl, and mix until the dough comes together roughly. The butter should still be in recognizable pieces and most of the lour should be moistened but not wet. You may not need to add all of the liquid. Turn the dough onto a lightly floured surface. With the heels of your hands, a pastry scraper and a rolling pin, quickly shape into an 8-by-14-inch rectangle, with an 8-inch side facing you and the long sides perpendicular to the near edge of your rolling surface. The dough may not knit together at this stage, but don’t worry, it will eventually. With the help o a broad, rimless baking sheet, fold the bottom one-third of the dough over the middle third. Brush off any lour, and then fold the top third over the middle. Lift the dough dough as you reflour the surface and turn the dough 90 degrees, so that the top flap is on your right, like the cover o a book.